Australian Prime Minister Malcolm Turnbull looks with Australian Federal Police Commissioner (AFP) Andrew Colvin and Australian Justice Minister Michael Keenan at firearms on display in Sydney, Australia, October 6, 2017. 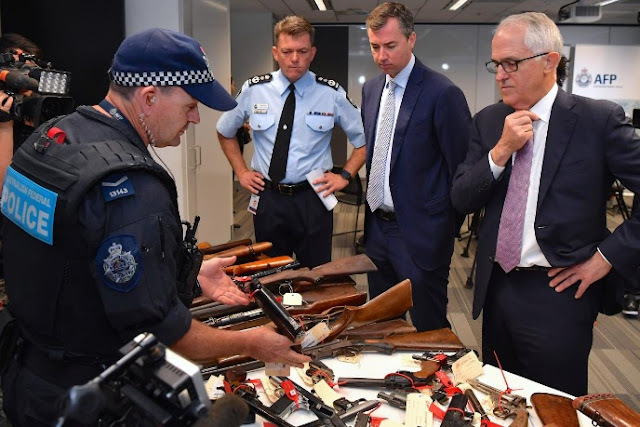 SYDNEY - Australian Prime Minister Malcolm Turnbull said about 51,000 illegal firearms, a fifth of all illegal guns in the country, were surrendered in a three-month amnesty ending Friday. Turnbull said Australia’s tough gun ownership laws, which ban all semi-automatic rifles and semi-automatic shotguns, severely limits the chances of a Las Vegas style mass shooting. American Stephen Paddock, 64, armed with multiple assault rifles opened fired on an outdoor country music festival in Las Vegas from a high-rise hotel window on Sunday, killing 58 people before killing himself in the deadliest mass shooting in modern U.S. history. The illegal weapons surrendered during the three-month gun amnesty, the first in 20 years, will be destroyed. Australian Prime Minister Malcolm Turnbull said about 51,000 illegal firearms, a fifth of all illegal guns in the country, were surrendered in a three-month amnesty ending Friday.